-Hast du ein Rezept, um dich an einem bad day zu motivieren? Alles beginnt immer mit dem, was und wie du denkst. Es hängt also davon ab, warum der bad day ein bad day ist? Daher ist es wichtig, den Grund zu kennen, fokussiert zu bleiben und den Weg visualisiert vor Augen zu haben. -Was war deine bisher schwierigste und was deine beste berufliche Erfahrung? Die schwierigste Erfahrung kann ich ad hoc nicht nennen. Fest steht, dass diese Erfolge die besten sind. Aufgaben sind da um sie zu lösen und daraus für weitere Projekte zu lernen. -Was hat dich dazu gebracht, DG Daniel Gossmann Photography zu gründen? Für mich bieten nur wenige Berufe derart viel verschiedene Möglichkeiten und Herangehensweisen um einen Job für einen Kunden oder ein Projekt erfolgreich abzuwickeln. VIELEN DANK DANIEL GOSSMANN! RESPEKT! -Do you have a self motivational recipe on a bad day? Everything starts with what and how you think. It depends why the day is a bad day. So it is important to find out the reason. To stay focussed and to visualise your goal. -What was your harshest and what was your best working experience so far? The harshest experience I just can`t point out. But it`s a fact, that these successes are the best. Challenges are there to be solved and to learn something out of it. -What drove you to found, DG Daniel Gossmann Photography? Not many jobs are offering so much different possibilities and perspectives to do a job for a client or certain projects. THANK YOU SO MUCH DANIEL GOSSMANN! RESPECT! Mit der angekündigten Überraschung haben wir nicht zuviel versprochen! Heute Abend Könnt ihr im TV um 20:00 bei iLike auf Puls 4 einen Beitrag darüber sehen. Hello, welcome to World of Models family. Its a great honor to be able to interview another terrific photographer! So, just to start it up, tell us about yourself and hometown. How did you get interested in a career as a phtographer? How did all start. Thank you Ed. I was born in Eisenstadt, Austria and since I was a child I’ve been interested in photography. In 2010 I graduated from the Vienna Photoschool. 2011 I completed my master exam. 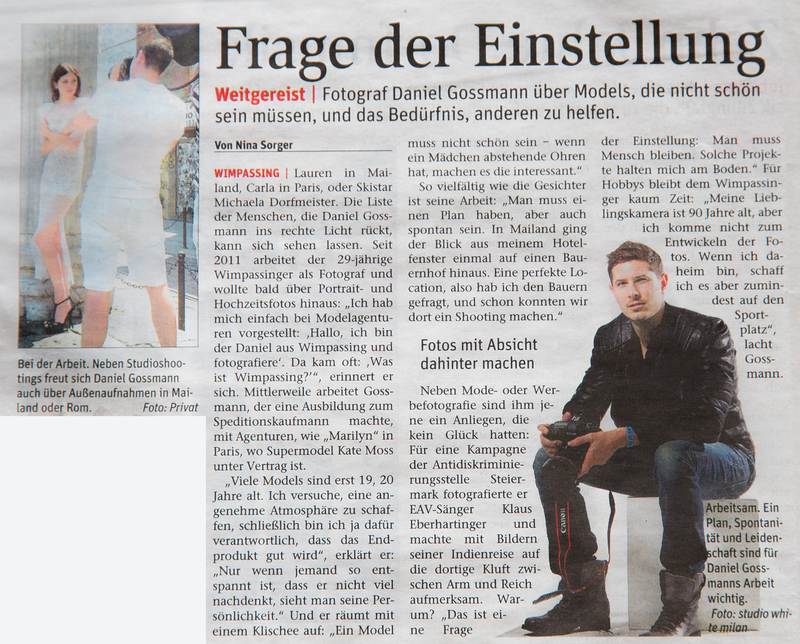 In 2012 I founded the Company “Daniel Gossmann Photography”. I define my work as a simple light style and I prefer to work mostly with hard light. The most important thing for me is that the light set is well because I don’t like to change the style on the computer. So I am a photographer and not a photo designer. Whats your main influences on photography? Main influences can be everything that I see in life! Take care about the little things around you and don’t forget your dreams when you sleep. Why not show these dreams in your pictures? The digital era really helped the photographers concerning quality and technology? Worlwide economic crisis on fashion photography? Yes that’s right but one should concentrate on thing’s which one can change actively. Alone you can’t change the crisis so you must adjust to the situation. Also bad time’s have their advantages! Special moments making very unique and cool pics? Yep, for sure. I can feel that. Sometimes it’s communication without words and gestures. Just the feeling between you and the model exits. A lot of, but the rule is – everything that happens on a shoot remains only between the involved people. Top cool favourite places for a shooting and why? The studio – the weather is always nice :)! IMAGE worth a THOUSAND WORDS? Absolutely! It’s not important that everybody likes your work but everybody must feel something when they look at your image. :-)…. I do have super power and everyone has super power. Discover yourself and find it out. After you know it – develop it. There isn’t only one. My superhero is the whole team on a shoot. The crew is very important. And a very important part for the quality at the end! You seem to have helped a number of models with their careers. What do you really feel about that? It’s important to push people. But you should be sure the people really want and have potential. Unfortunately you can’t push everyone. Apart from making photos I try to support all my models, especially if they’re young and new in the business. They should know when they are in front of the lens that everybody cares about them. But after the shoot the situation changes. It’s important that they don’t take off – it’s very important to have both feet on the floor. Daniel from here to the next 10 years? In 10 years everything is possible. But I prefer to think in shorter periods of time because long-term success never happens by chance and I work gradually on it. Dreaming about it is just not enough. Recently I’ve worked with models from Women Management and Elite in Milan. I liked them because they had a special charisma. Don’t speak about upcoming projects if they are not finished :)! I will think about special moment when it’s all over. Now it’s just the beginning! And when you´ll come to my world? I was in Brazil last year and I fell in love with your incredible country and the people there! A lot of people in Europe speak about dangerous things in Brazil. But that isn’t true! I hope to meet us again.